I remember the first time I made a recipe with saffron in it. After making my grocery list, I went to the store and walked down the spice aisle. Saffron… saffron… saffron… there it is. Wait, is this bottle empty? Why are there only a few little wisps inside and why is it so expensive? What is this stuff? Saffron is a spice that comes from the crocus sativas plant. When the crocus blooms, it has purple petals, yellow stamen and three dark orange stigma. These three threadlike strands are plucked and dried to produce the spice we call saffron. Saffron is a spice used in recipes like paella, bouillabaisse and many Middle Eastern dishes. It has a unique flavor that can be hard to describe, but if you’ve ever had authentic paella or yellow rice, you can’t mistake the bright yellow color and earthy aroma. Even though saffron is the most expensive spice per ounce, a little goes a long way. You generally only need a few strands to flavor an entire dish. Saffron is also used in medicine, dietary supplements and beauty products. What Should I Look for When Buying Culinary Saffron? Look for threads that are dark red and even in size. Stay away from broken or dull threads or anything that looks like it has been mixed with other flower parts. What Are Some of the Health Benefits of Saffron? The most promising research around saffron has been in the treatment of depression. Some studies suggest treating mild to moderate depression with specific saffron extracts might be as effective as prescription medication. This is why you might see it included in mood-boosting or emotional support supplements. 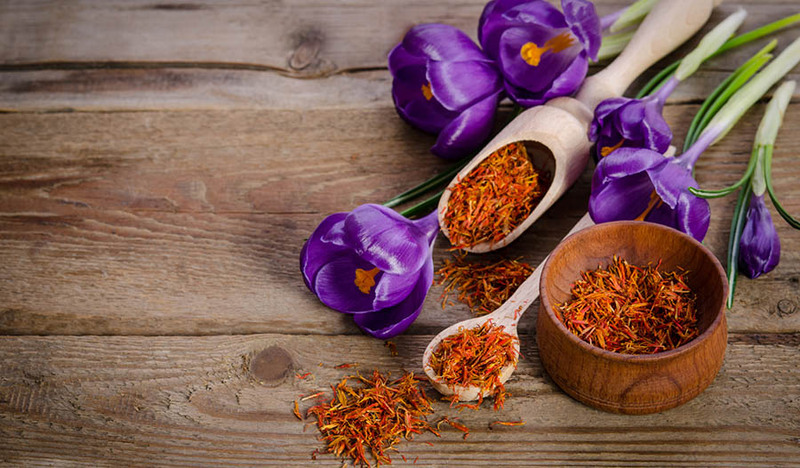 Saffron may also have the potential for treating neurodegenerative disorders such as Alzheimer’s and Parkinson’s because of two chemicals called croci and crocetin. These chemicals may help learning and memory function, but more research is needed. Supplements containing saffron may also help with premenstrual syndrome and menstrual discomfort as well as macular degeneration and weight loss. It is important to note that taking saffron in very large doses (5 grams or more) is possibly unsafe. The amount of saffron varies widely between products. Pay attention to the number of milligrams per serving and talk with your doctor before beginning supplementation, especially if you are or may be pregnant or breastfeeding, have a heart condition or low blood pressure. Do not take saffron if you have bipolar disorder. The easiest way to get saffron into your diet is by cooking with it. Thankfully, you only need a small amount to enjoy the rich flavor and bold color. Here is a recipe to get you started. Soak the pinch of saffron threads in 2 tablespoons of hot water for 10 minutes. Rinse and drain the rice. Heat the olive oil in a pot over medium heat. Add the onions and sauté for about three minutes, until soft. Stir in the rice, broth, saffron and water, and salt. Bring to a boil over high heat, then immediately cover and turn the heat to low. Let the rice cook covered on low for 20 minutes. Turn off the heat and let rice sit for 5 minutes, then remove the lid and fluff with a fork.